Eaoron Jacaranda Miracle Mask for Sensitive Skin 25g x 5 piece!!! 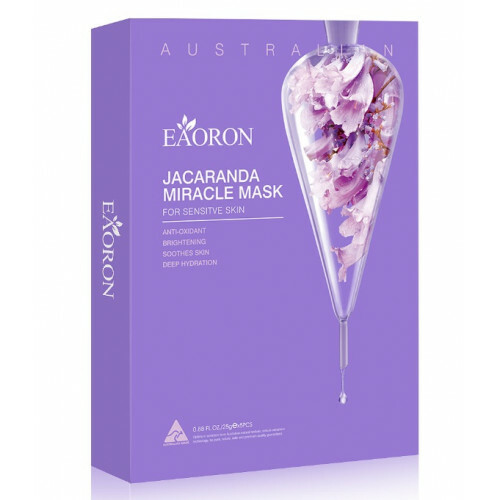 Face Mask includes extracts from the Australian Blue Jacaranda which is known to contain anti-inflammatory, anti-oxidant and brightening properties. It contains an advanced moisture complex to hydrate the skin immediately and continuously for 48 hours. It includes natural ingredients such as jacaranda, witch hazel and chamomile extracts, ideal for sensitive skin. On a clean face, gently apply the mask onto your face and make sure all areas are covered, avoiding contact with eyes and lips. Leave the mask on for 15-20 mins. Peel it off and massage any remaining essence into your skin.